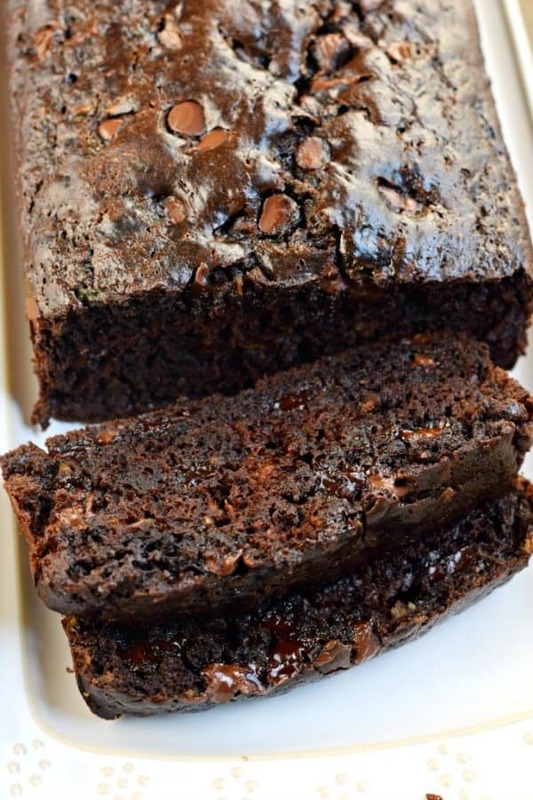 Delicious, extra fudgy, Double Chocolate Zucchini Bread. 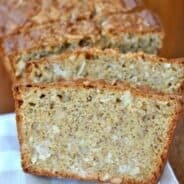 Recipe makes two freezer friendly loaves of zucchini bread! 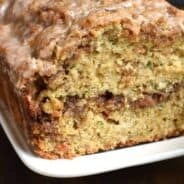 I’m back again this season with another zucchini bread recipe! 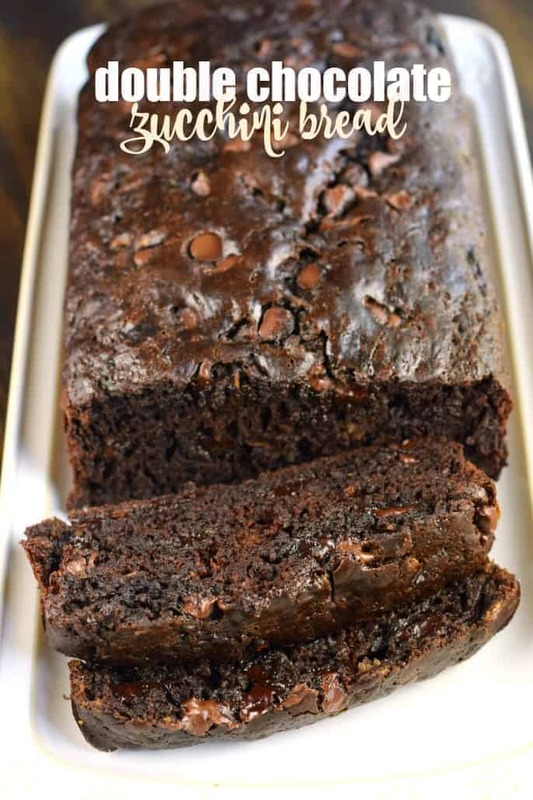 This one is a scrumptious, more like a dessert bread than breakfast…but, hey, to each their own! One of the best parts of zucchini bread is that it adds an incredible amount of moisture to whatever it is you are baking. 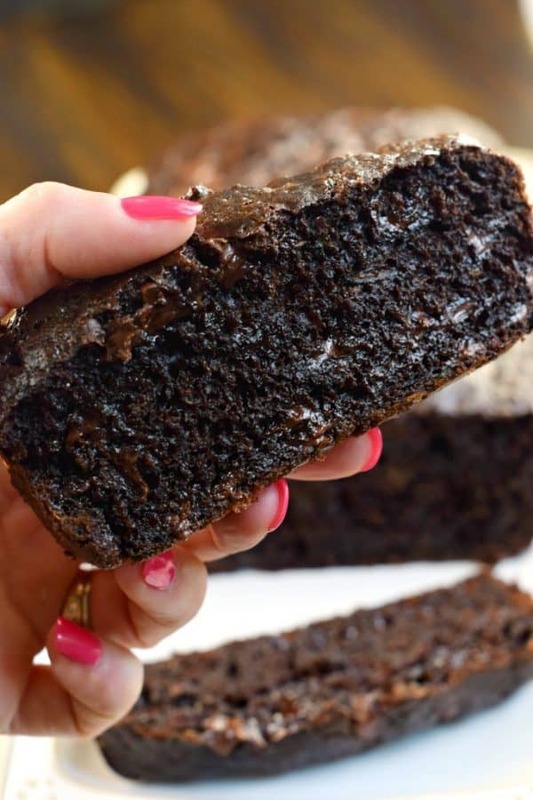 So this BEST EVER Double Chocolate Zucchini Bread has the texture of cake, but the richness and fudginess of a brownie. Of course, using good quality chocolate is a must. 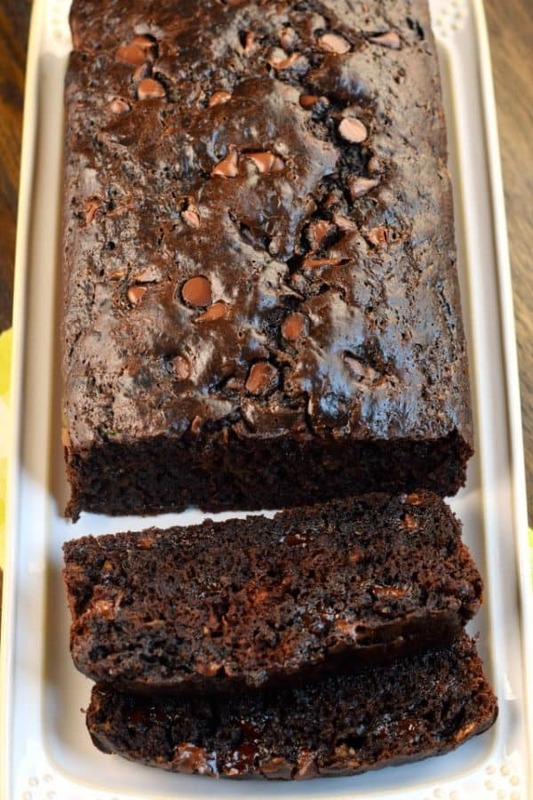 I love using Ghirardelli chocolate chips in my baked goods. They keep their shape and add decadent flavor! *First, start by shredding your zucchini. If you’re using frozen shredded zucchini, allow it to thaw, then squeeze out all the excess liquid in a towel. I leave the skin on my zucchini when I shred it, but if you really want to HIDE the zucchini, be sure to peel it first. *Next, combine your eggs, sour cream, vegetable oil, sugar, and vanilla together in a mixing bowl. Once blended, add in flour, unsweetened cocoa powder, baking soda, baking powder, salt, espresso powder, and zucchini. Fold in chocolate chips. *Pour batter into TWO greased loaf pans and bake in a 350 degree F oven for about 45-50 minutes. Cool, slice, and enjoy. *To freeze today’s bread, bake accordingly and allow to cool completely. Once cooled, wrap in foil, then slide into a large gallon sized ziploc bag. Freeze for up to several months. To thaw, remove from freezer and place on counter overnight (remaining in ziploc bag). ENJOY in the morning! HELP! I have so much zucchini, what can I make? Zucchini Bread: I’ve got you covered here from my mom’s classic bread, to Pumpkin Zucchini bread, to this delicious Cinnamon Swirl Zucchini Bread recipe. My archives are filled with other flavors too, so be sure to check them out! Zucchini Cakes: Yes, you read that right. Zucchini adds moisture to all baked goods, just like carrots (and Carrot Cake). Some of my favorite cakes are Chocolate Zucchini Cake, Lemon Zucchini Cake and Zucchini Bundt Cake. All are delicious, you decide for yourself which flavor is best! Baked Goods in general: From Chocolate Zucchini Brownies, to Zucchini Banana Bars, everything tastes better with a little vegetable added in! Your family will not even know that this Zucchini “Apple” Crumble doesn’t actually have any apples in it…yup, it’s ALL zucchini. And it’s amazing. Meatballs. Yes, you read that right. Zucchini Meatballs are absolutely amazing. Top them with some marinara sauce and cheese and you have a meal, with pasta or on a sub. These Greek Zucchini Meatballs are perfect with homemade tzatziki sauce and fresh pita. ENJOY! Be sure to check out my ZUCCHINI board on pinterest. Packed with hundreds of recipe ideas, sweet and savory! 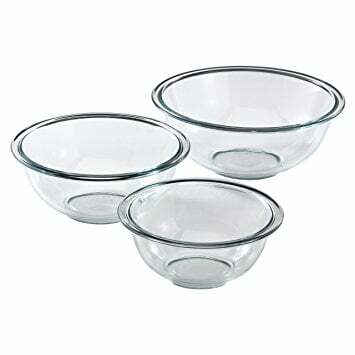 Preheat oven to 350 degrees F. Line the bottoms of two 9-inch loaf pans with parchment paper and spray with baking spray. Or grease both pans generously. In a large mixing bowl, combine the eggs, vegetable oil, sour cream, sugar, and vanilla until blended. Add in flour, cocoa powder, baking soda, baking powder, salt, and espresso powder. Mix until combined. Fold in zucchini and 1 1/2 cups chocolate chips. 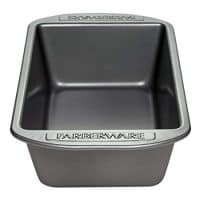 Pour batter evenly into two prepared baking pans. Top with remaining chocolate chips. Bake for 45-50 minutes. Remove from oven and cool on wire rack for 5 minutes. Remove from baking pan and cool completely. If freezing, cool completely then wrap in foil. Slide into a gallon sized ziploc bag and freeze for several months. Place on room temperature counter to thaw overnight (still in bag). 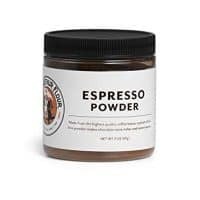 Adding the Espresso Powder does NOT make it taste like coffee. 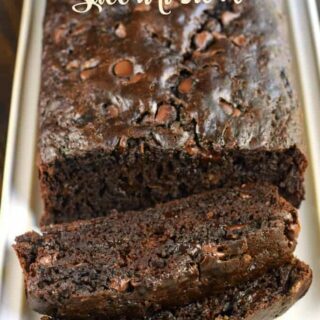 It just brings out the richness of the chocolate. I use this one from amazon! Wow this looks like so much chocolatey goodness! I still have zucchini that needs to be used. This is a great recipe to use them! This looks like a slice of heaven!! Yum!! You are the Zucchini Queen! I cannot believe all of the wonderful recipes you have developed, especially that meatball one. I wish my Italian Wedding Style canned soup had some of those in there. 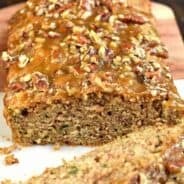 My grandmother used to bake my family a loaf of zucchini bread every fall and I thought it was so delicious. I must admit, I have only Home-Ec baking skills from the 10th grade, but this chocolate loaf is so utterly enticing. Maybe I ought to try your Mom’s recipe first. This looks absolutely delicious! Need to make soon! YUM!!! I love this delicious version!!! I am just going to tell myself this is healthy because of the zucchini! If using fresh zucchini, do I need to squeeze out the liquid? Whenever I grate fresh zucchini, there’s always a lot of water. Your directions only discuss what to do if using frozen zucchini. Thanks!